iGrow Whatever You Like is significantly sustained by the sale of products and services including iGrow Buckets, iGrow Gardens, workshop registrations, not to mention that real-life sales and customer service experience empowers our youth for their futures. 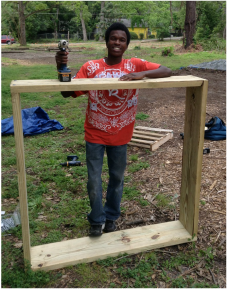 Thank you for supporting iGrow's capacity to grow good food and youth empowerment through your purchase. Raised beds are a great way to get a quick jump on a vegetable or herb garden. If you're hoping to grow your own food, but don't know how to get started, choose an iGrow Garden. Our raised beds enable you to avoid the headaches of: digging, incessant weeds and several seasons of poor crops. We offer 4x4 raised bed kits, pre-constructed frames, and "Ready to Plant" raised beds, which we'll build, install, and fill with our compost "magic mix" to to ensure the health and productivity of your plants from the start. We offer basic installs, planting*, and/or personalized installation tutorials* (upon request) to transfer as much food garden knowledge as possible into your hands. (*for an additional fee). Grow Your Groceries in 5 minutes a week. 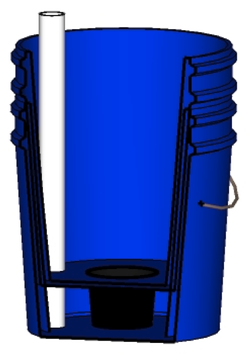 The iGrow Bucket is a Self-watering” mini food garden built using two five-gallon buckets. It has a water-reservoir at the base that allows for bottom-up watering, which encourages the roots to grow down and helps ensure consistent moisture for maximum food production. Rich Compost mix ensures high nutrient vegetables. Just Add Water iGrow Bucket. Filled with magic compost-mix. Pre-planted with an heirloom tomato (spring/summer) or snap peas (fall/winter). Comes with built in trellis. iGrow Bucket. Pre-filled with magic compost-mix. iGrow Bucket. Fill. Plant. Water. Eat. In case you need another or want to add to a "Ready to Plant" Bucket. Workshops are intensive, hands-on trainings offering diverse groups the opportunity to learn, plan, develop, operate, and sustain community food projects. Project participants leave the workshop with improved skills that they can take back into their communities and pass on to others. These workshops are applicable to both rural and urban projects. Workshops cover subjects ranging from fall and spring gardening, pest management, edible landscaping, and how to grow for market to compost and soil building to community engagement and community garden start-up. 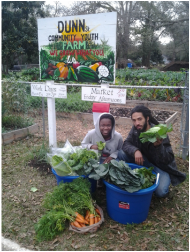 We are a youth empowerment organization with an intent to grow community-based food systems amongst people of all walks of life, so we ask that you intentionally share our workshop opportunities with people across lines of division such as age, race, neighborhood, profession, and income. -Walk-up, Picked-to-Order Market (at iGrow's Dunn Street Youth Farm, 514 Dunn Street). If you walk up and let us know what you want, we'll harvest your food on the spot. It can't get any fresher than that! -In a growing list of Tallahassee Farm-to-Table restaurants including Miccosukee Root Cellar, Cypress Restaurant, Kool Beanz Cafe, Leroc Bistro, and Sweet Pea Cafe. Proceeds from sales go to support iGrow's work of growing good food for the community, offering meaningful (paid and volunteer) work to young people, and equipping youth to teach other youth principles and practices of urban agriculture. For purchases made Tuesday through Sunday, your iGrow Bucket(s) and iGrow Garden(s) will be available for pickup after 5pm, Monday afternoon at the Dunn St Youth Farm (514 Dunn St). Purchases made on Monday will be ready the following Monday. If you ordered a "Ready to Plant" (installed) iGrow Garden, we'll be in touch. If you have other questions or would like to order in bulk, email us at igrow.whateveryoulike@gmail.com.